One-way limited vision mesh is sometimes referred to as DVA mesh. It is an aluminium perforated or expanded mesh for screen doors that is designed to create the effect of being able to see through from one side to the other without the other side being able to see back. Hence, the creation of one-way limited vision. Security Limited One Way Vision doors and windows play a major part in a home or office allowing access to the front of the property and entertaining areas, allowing air flow throughout the house without compromising your safety and security. Product strength and performance are key factors in deciding which security doors to purchase. Security doors and windows manufactured by Dongjie Wire Mesh give you the peace of mind that a quality door is being installed. 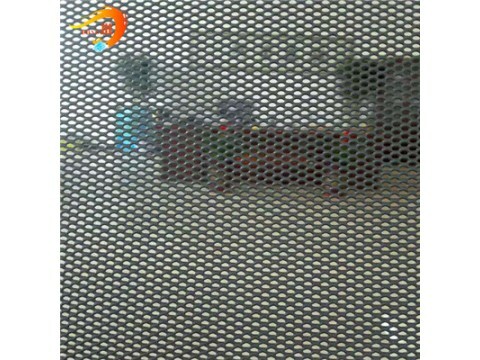 A rigid mesh with small openings designed to be an effective insect screen with enhanced security. This product is availabe in different distinctive mesh patterns. It is the ideal protective mesh for doors and windows that is stronger than traditional wire or plastic screen meshes. Our aluminum DVA one way limited vision security window and door screen mesh offers greater security because it is much more resistant to breaking or cutting. the uniform openings allow free passage of air, sound and light. Functional and distinctive design. It is made from one piece of steel with no welds or braids. It is offered in many different sizes.